We would like to take this opportunity to thank you for your kind support all the time. Please kindly be advised that our company will be closed from January 30, 2019 to February 11, 2019, in observance of the Chinese traditional festival, Spring Festival. Hence our office and warehouse are closed during the above period. 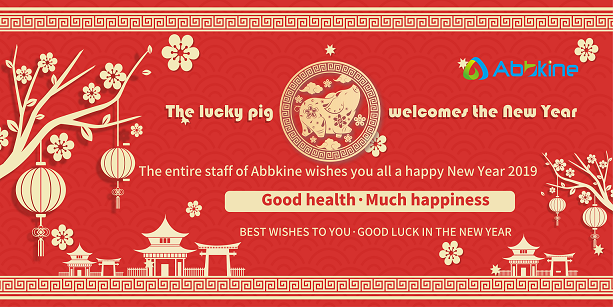 Please feel free to contact us by sending E-mail to service@abbkine.com. Orders will be accepted but not be processed until February 12, 2019, the first business day after the Spring Festival. Sorry for any inconvenience caused. Abbkine serves global scientists in the field of Proteomics and Cytology, and is committed to the innovation and development of various proteomics and cytology related research reagents, with a view to becoming a key promoter in the fields of life science research and drug research and development, etc. Proteomics products cover from sample preparation (protein extraction, purification and coupling), protein quantification to antibodies and kits for protein detection; Cytological products include cytokines for cell culture, cell state detection, staining, organelle extraction, cell metabolism and cell pathology. Abbkine relies on its product portfolio and unique marketing support as its main marketing strategy and product innovation model, only to help your research career.